The custom lots in Sutter Park will be going on sale very soon. How much would you pay for one of them? These are the few lots in the North East corner that are not being developed by Tim Lewis Homes. The lots will be ready for building on them and a new owner can hire their own contractor to build their dream home as long as it meets the Sutter Park neighborhood building requirements. The lots that are going up for sale range in size from .25 acres up to .42 acres (10,800 square feet to 18,700 square feet). 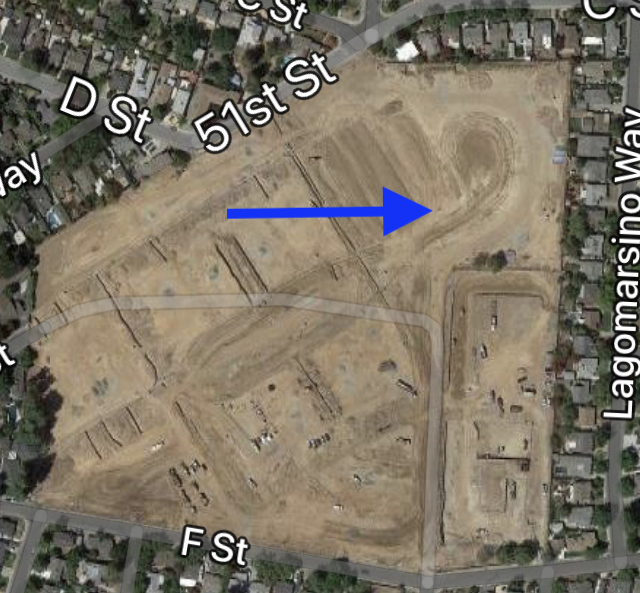 How much would you pay for a large buildable lot in East Sac’s new Sutter Park neighborhood? How much do you think they will actually sell for? Thanks Nathan. I appreciate the info. It’s really surprising to hear how big some of these lots are going to be. Part of me wonders why they didn’t make the neighborhood a little more dense so they can build more units. After all, tiny lots seems to be the trend these days in so many developments. The majority of lots within the development are having homes built on them by Tim Lewis Homes and those lots are much smaller, ranging from .05 acres to .115 acres (2,250 square feet to 5,000 square feet). I guess they wanted Sutter Park have their own little version of the Fab 40’s with larger houses on larger lots. That makes sense. I can see that. So these lots will actually be available for purchase so owners can do a custom build? What a huge size for East Sac. Yes and apparently several of them have already been pre-sold before the rest were listed so the demand is there.